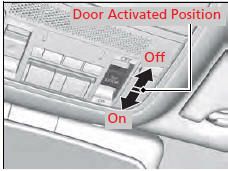 The interior lights come on regardless whether the doors are open or closed. • When any doors are opened. • When the power mode is set to VEHICLE OFF (LOCK). The interior lights remain off regardless whether the doors are open or closed. • When you set the power mode to VEHICLE OFF (LOCK) but do not open a door. • When you close the driver’s door in ACCESSORY mode. • When you set the power mode to ON. If you leave any doors open, the interior lights go off after about 15 minutes.